Surgery and medication have been the most popular recommendations by many health professionals for healing and pain management. However, in recent years, patients have found that they are able to find relief and healing without the use of pain meds or surgery. One such patient is Paul. Paul had a herniated L5 disc and was told by two neurosurgeons that surgery was the only way that he would find relief and heal his back. However, he decided to try the DMR Method as a last resort before he opted for surgery. After treatment, Paul not only found relief from his back pain, and regained used of his foot, but also the injured disk was found to be completely healed. If you are interested in learning more about the DMR Method and finding if it’s the right fit for you, visit our website and contact our chiropractors for a free consultation. What if I Choose Surgery? The DMR Method is often the last resort treatment before surgery. 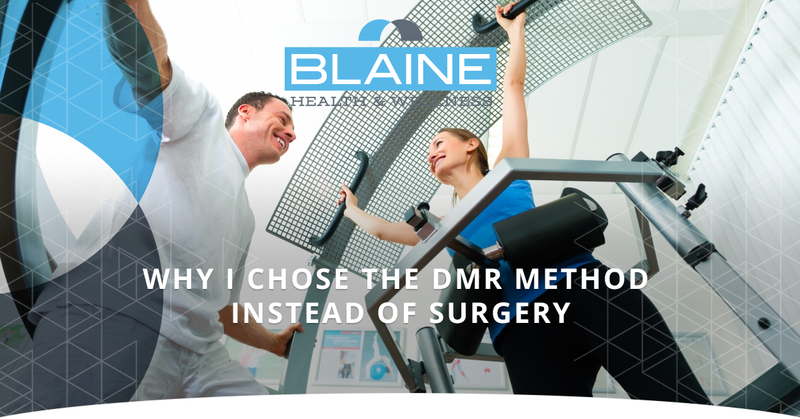 If you are hesitant about whether you should try the DMR Method versus surgery, here is what you can expect when you choose surgery. After surgery, you can expect to experience some time spent recovering from your surgery, as well as time spent in physical therapy. Your recovery and healing time will depend on the type of surgery, complications encountered, and your state of health. As you read above, when you opt for surgery, you are at risk for infection, bleeding, nerve damage, and stiffness. However, because of the holistic approach to treatment and the non-invasive nature of the DMR Method, your treatment risks are significantly reduced. Depending on your case, you can receive DMR Method treatment from our chiropractors and other health professionals on your time. You will not need to interrupt your life with recovery time and physical therapy like you would with surgery. Many pain medications can have side effects such as addiction that can complicate your treatment plan. Because the DMR Method is a means of pain management and integrative care, often that allows our patients to avoid medication and the side effects that it can cause. If you are interested in discussing your options, contact the chiropractors and health care professionals of Blaine Health & Wellness. We would love to help you find relief and healing! Visit our website to book an appointment or a free consultation.